European energy asset transaction activity is on the rise, with infrastructure and private equity funds are showing an increasing appetite for energy assets. But asset buyers are being confronted with the challenge of determining how to monetise asset value in the traded energy markets. European energy asset transaction activity is on the rise. After ambitious but largely unsuccessful growth and acquisition sprees last decade, utilities are selling off flexible assets & downsizing trading functions. In a world of unpredictable asset margins and lower price volatility, utilities are reverting to the perceived safety of core business and subsidised renewable asset development. E.ON’s intention to spin-off its thermal generation and commodity trading business is perhaps the most prominent example of this change in tack. Infrastructure and private equity funds are showing an increasing appetite for energy assets. This is being fuelled by favourable lending conditions and growing pools of capital chasing yield. But funds are also facing competition from commodity trading companies, such as Glencore, Vitol & Mercuria. Commodity traders are acquiring assets and bolstering their energy trading capability, encouraged by the regulatory driven exit of investment bank competitors. The approach to these challenges varies widely across asset buyers. But risk appetite and existing commercial capabilities are two important factors determining how companies approach monetisation of newly acquired assets. We explore those drivers in more detail today. Each of these strategies ultimately involves a trade-off between expected return and risk. So a company’s risk appetite is typically the primary driver of which strategy is adopted. Chart 1 provides a simple illustration of the risk/return trade-off for each of the different asset monetisation strategies. Spot: The decision to operate assets on a purely merchant basis is typically driven by necessity (e.g. peaking assets with little intrinsic value) or as a high level strategic choice (e.g. Exxon’s approach decision to undertake limited hedging of its spot oil exposures). Static intrinsic: This ‘hedge and forget’ approach is typically unnecessarily conservative, unless an asset is deep ‘in the money’ or operating in a very illiquid market. Static intrinsic + extrinsic: Selling the full flexibility of an asset via a structured long term contract (e.g. a tolling agreement), is attractive for more conservative investors (e.g. infrastructure funds). It allows the monetisation of asset extrinsic value (albeit at a discount to expected value), while avoiding the complexity and costs of developing a trading capability. Rolling intrinsic: This ‘risk free’ hedge improvement strategy is perhaps the most common strategy for realising asset value, given the relative attractiveness of its transparency and risk return trade-off. Delta hedging: Hedging forward exposures on a probabilistic basis is a strategy typically favoured by companies with sophisticated existing trading capabilities. It targets the capture of maximum expected value whilst directly reducing risks, but requires greater analytical and trading overheads. As in our previous article on these strategies, we note again that in reality many companies adopt hybrid approaches that combine more than one strategy. The commercial and operation capability required to support asset monetisation is also an important driver of monetisation strategy choice. Business capability requirements vary widely across the different strategies. The cost of developing and maintaining an appropriate capability in-house is an important consideration and needs to be offset against expected asset return. An increasingly common way for infrastructure funds to avoid substantial business capability development costs is to outsource their ‘route to market’ to a third party. This can be done for example via an energy management services contract (and applies to all the boxes marked in the table with an asterisk). Whether or not it is outsourced, a basic operations, scheduling, risk control and finance/invoicing function is required for all strategies. 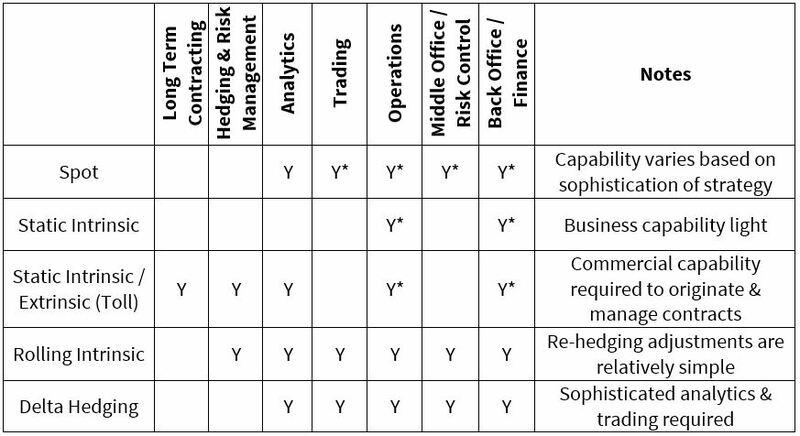 Structural asset hedging and risk management decisions (where these are relevant), often managed by a hedging or risk management committee. Day to day trading and optimisation decisions, usually managed in real time by a trading desk. A full trading capability and supporting functions are required to implement more sophisticated spot, rolling intrinsic and delta hedging strategies. Whereas a static intrinsic and a more passive static intrinsic/extrinsic strategy require less regular contracting & hedging decisions and only a basic operations and back office function. As an example, decisions around implementing a rolling intrinsic or delta hedging strategy will typically be made at the trading book level. Whereas contracting and hedging decisions for a more active static intrinsic/extrinsic strategy are likely to be developed by the asset owner’s commercial strategy function. But in both cases these decisions are guided by overall a company’s risk appetite and commercial strategy. The transfer of energy assets from utilities and producers to investment funds looks set to continue. But these funds are showing little interest in developing their own energy trading capabilities, due to a combination of business model considerations, overhead costs and risk appetite. This is supporting strong growth in ‘route to market’ and ‘energy management’ services. The logic of these service partnerships is simple. It makes sense for funds to outsource ‘market facing’ capabilities to companies that already have an established market presence. This includes commodity traders, banks and (somewhat ironically) the trading functions of utilities and producers. Capturing an effective balance of these factors in a long term contract is a big hurdle. But contractual structures are starting to become more standardised as fund transactions increase. We will return to set out some of the key principles behind a successful contractual partnership in an article to follow.